This version of the Rhumba is finished with a brushed nickel effect, it has dual levers for water operation. Q. The reviewer suggest an after run - is this a poor design feature or a one off? We haven't had any other comments regarding this issue. However, this tap comes with a 15 year guarantee so, in the unlikely event of this occurring, the tap would be replaced within that time. Q. Does the swan neck turn to serve two sinks? The swan neck does swivel. The distance from the hole centre to the outlet of the tap is 230mm. Please check that this measurement is suitable before ordering this tap. HI, brushed nickel is its own colour but does look similar to satin steel finish. I hope this helps. Good tap. Easy to install. Yes, this is a smart tap but dribbles after switching off - see CL Plumbing's review. 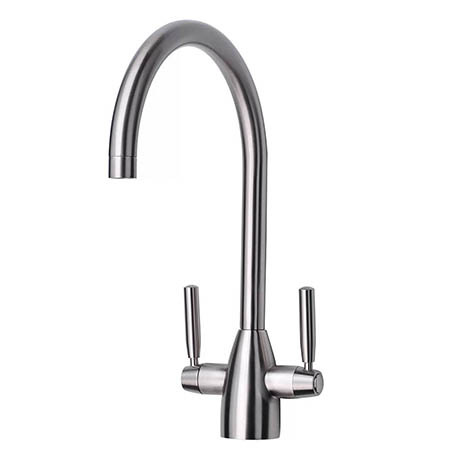 I have found a solution - buy a "Tap Adapta Spray Adjuster" from Lakeland, remove the existing aerator from the end of the tap (you will need suitable grips to unscrew it) and replace it with the end bit of the Tap Adapta. Result - no drips no siphoning! beautiful design, BUT it siphons, or after run!! When you close the tap after few seconds water runs from the spout. Not recommended.